This relatively small canvas is one of an early group of works remaining from the beginning of the artist's sojourn in Australia. He was attracted by the unusual appearance of the Australian landscape, the architecture of the farmhouses, the dominance of trees and bush and the lavish use made of timber in the construction of the man made environment. The painting is on a Belgian linen canvas primed in white over which are washed various light tints which peer through in the final paint layer. The relatively small number of landscapes Matthew Moss painted in Australia before this, concentrate on the buildings and the farms themselves. In this painting the artist confronts the unusually formed and shaped Australian native trees, especially the variations of the native Eucalyptus, for the first time. This interest in the unique forms of Australia's indigenous trees is often noticeable in the work of the early European settler artists in Australia and especially the most notable, John Glover° who moved to Van Diemens land from London in 1831. Glover's landscapes are often attempts to come to terms with a type of tree which assumes such unusual and contorted forms, so different to those of Europe. Later nineteenth‑century landscapists like the German Hans Heysen tackled the same problem by imposing a European style on the gum trees, in his case, by working in the manner of Pieter Paul Rubens. Matthew Moss, in this canvas, has taken the distorted tree trunks and simplified them, making them stand out against a dark blue sky. The sombre brooding nature of the landscape, enforced by the dark sky and the terra verde tinted landscape, is emphasised by the dark violet of the stone cottage. An early Australian link with Italy is preserved in the bluestone farmhouse of the painting. This part of the canvas is based on the artist's pencil drawing of two abandoned stone farm buildings from the Yandoit region of the state of Victoria. These buildings are all that remain of a Piedmonte colony that settled in the region in the middle of the nineteenth century and imported their distinctive style of stone‑built architecture, The drawing was also the basis for a small painting in which the two farmhouses are described in more detail. The artist's interest in the way timber was used in fencing, and the sculptural shapes it assumed with use and weathering is visible in the foreground elements. 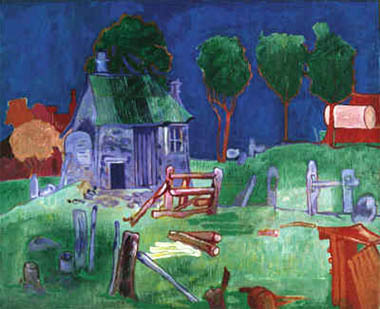 Together with the tree stumps depicted, this theme runs through a number of the artist's subsequent canvases. The abandoned relics of machinery and the timber shed at the bottom right of the canvas are all that remain of more complex elements that were progressively eliminated during the painting's creation. The soft appearance that the surface the canvas displays results from light priming and the use of diluted pigments. The canvas is given its direction and its style by the sharpness of the colour contrasts and the saturated nature of the main tones. This painting formed part of the series of works which the artist exhibited later in Melbourne and Sydney.